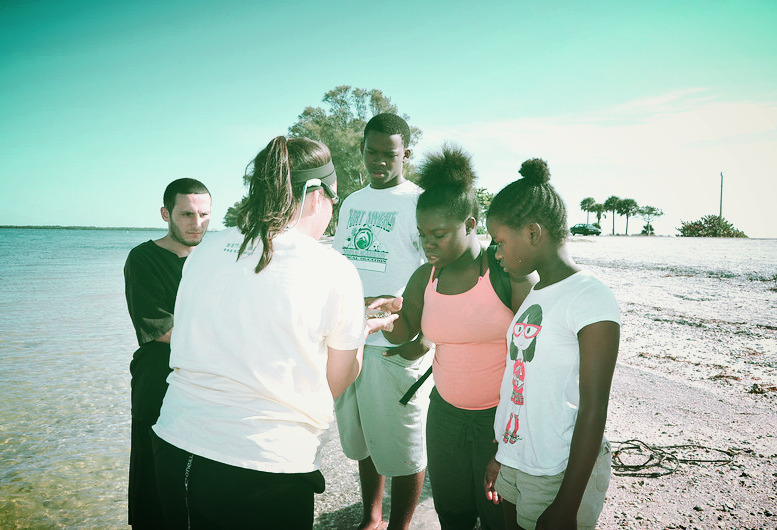 Students from the Pine Manor Improvement Association explore the beaches of Causeway Islands Park with Sanibel Sea School. Octifest on the Beach, Sanibel Sea School’s annual ocean celebration and fundraiser, will once again be held bayside on Causeway Island A. The event will take place on Saturday, March 19th, and this year’s celebration marks ten years of ocean education and outreach on Sanibel. “It’s really incredible to look back at the past decade and consider how much this organization has grown,” says Dr. Bruce Neill, who opened Sanibel Sea School in 2006 with his wife, Evelyn Monroe Neill. What started as a tiny school offering ocean-themed day classes for kids now also offers summer camps, boat trips, adult programs, and more – and all outings are field-based, so students build meaningful connections with the marine environment while getting their feet wet, and leave feeling inspired to be better stewards of our seas. It is thanks to support from the local community that Sanibel Sea School is able to provide these outreach programs, which are fully funded by donors. Octifest is the largest source of funds for the organization each year. “We hope you will come out to enjoy the sunset, eat a delicious meal, and help us continue to do great things for our oceans and our kids,” Neill says. To learn more about Octifest or to purchase tickets, visit octifest.org or call 239-472-8585.